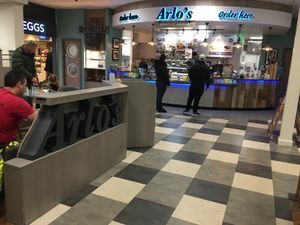 Arlo's is Moto's self-branded restaurant. It was first introduced to Chieveley in 2015 and was rolled out to Moto's neighbouring services during the first half of 2016. It is themed around a patisserie, which allows for a thorough redesign of the serving area. Although it is functionally the same as the EDC it replaced, the revised menu and layout, as well as better trained staff, created a fresher appeal and one which Moto hopes will see a higher turnover. It has now become one of their preferred catering brands, but there still aren't many branches, as its introduction is usually accompanied by a thorough refurbishment.